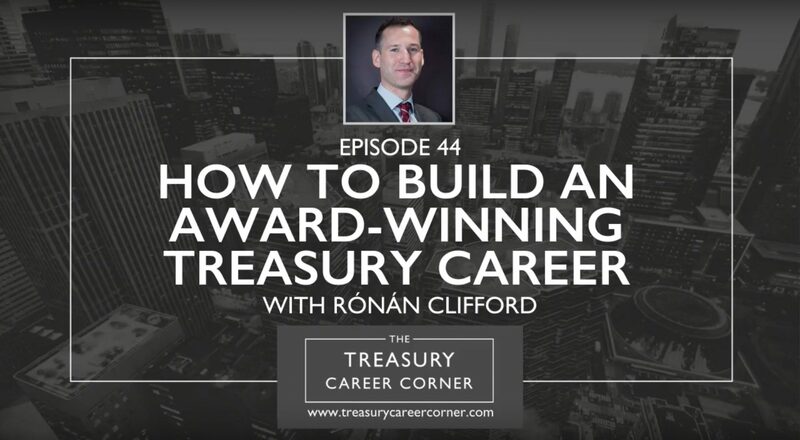 I’ve got a very special guest on this episode of the Treasury Career Corner podcast and that’s none other than Rónán Clifford, the Treasury Director at EMEA Corporate Treasury, Honeywell. Rónán has been part of the Honeywell treasury team based in Belgium since 2015. His core responsibilities include bank relationship management, liquidity and banking infrastructure, FX risk, trade finance, M&A due diligence and integration and colleague development. He was EMEA treasury lead in delivering the carve out of 2 companies from the Honeywell portfolio, as part of $20bn USD of divestitures in 2018. Prior to joining Honeywell, he worked at Pfizer. One of his key achievements was establishing the treasury centre for Zoetis (Pfizer’s Animal health IPO from 2013), where he headed up the Front Office. He holds a BA in Political Science & Mathematics from University College Dublin, an MSc in Financial & Industrial Mathematics from Dublin City University as well as a postgraduate qualification in Corporate Treasury from the Irish Association of Corporate Treasury / Dublin City University. He has a passion for continuous improvement and is a qualified 6 Sigma Green Belt. He has also won several treasury awards including from TMI and Adam Smith. To keep sane, he is a keen sports enthusiast and has completed several marathons, triathlons as well as White Collar Boxing events. Would you like to get in touch with Rónán? If so, you can connect with him via LinkedIn.